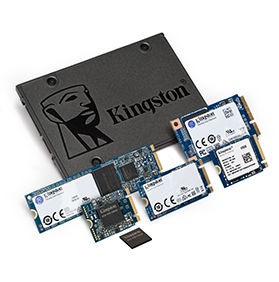 Kingston® offers a line of Design-In SATA and NVMe solid-state drives created specifically for system designers and builders. Design-In SSDs incorporate advanced controllers that automatically perform wear-leveling, garbage collection and other NAND Flash management features. They are a drop-in replacement for hard drives and deliver up to 20x greater performance as well as high reliability. Design-In SSDs incorporate next-generation 3D NAND Flash. Leveraging high volume material purchasing means we can maintain competitive pricing. Look to us for global high-volume, mass production facilities with advanced manufacturing technology and expertise.